WHAT DO WE MEAN BY A SUSTAINABLE WORLD? 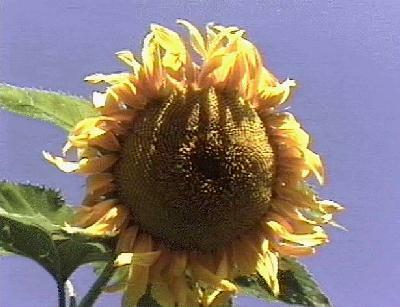 Photo of sunflower from Community Gardens by Mark McCaffrey In earlier articles of this series, we saw that if on our Earth, which is a materially closed system, population and consumption are allowed to grow exponentially, then the basis for a sustainable world of which we are a part will be destroyed (Palmer, 2000a). But what do we mean by a "sustainable world"? Sustainability requires humans to learn to live within our means. Major factors, such as human population size, biosphere robustness, resource stock, food supply, and environmental quality must remain in balance, on a global scale. This state of balance must last long enough so that it will not be merely a blip on the curve of unsustainable growth (Zen, 2000a). Even though we might not really attain that balance, we must move in that direction if humanity and the ecosystem are to survive. Because the Earth is a closed system, a sustainable world is not compatible with "sustainable growth" (Palmer, 2000b). A closed system might conceivably accommodate "sustainable development," a term popularized by the World Commission on Environment and Development (1987; the "Brundtland Commission"), but how that could be done is not obvious (see, however, Daly and Cobb, 1994, Appendix). Another way to look at the issue is to consider the idea of a transition towards sustainability (Board on Sustainable Development, 1999), which, however, needs a complementary discussion of the destination, or end-state, of that transition. Most of us probably accept the proposition that everyone should have access to fair shares of food, water, shelter, and health care. Surely we want to sustain a healthy environment and a robust ecosystem. Certainly we want to promote equity among societies, to reduce disparity between the rich and the poor, to protect human dignity, and to minimize state terrorism. While moving toward that goal, we need to protect the capability of future societies to make real choices for themselves, whatever their social organization or cultural and religious affinity. If these goals seem incompatible with steady growth of population and our present rates of material consumption, then we need to do some careful soul-searching about our national obsession for ever-increasing economic throughput (Demonstration 1). To take sustainability seriously requires us to reexamine our ideas about growth, social equity, consumption, and "standard of living", that putative indicator of social well-being. Sustainability is constrained at both ends of the economic throughput. At the starting point it is constrained by the availability of resources, and at the end point by the accumulation of the products of their use: waste, loss, and pollution. Consumption and systems of material distribution, the processes that link those two ends, go to the heart of the matter. The scale of global consumption, both public and private, depends on population size and on the intensity of resource use. What are some of the implications of sustainable consumption of resources (Zen, 2000b)? For those living at a subsistence level, to consume is to survive. This is true today for about a third of the world's human population. For them, amenities beyond survival are largely luxury. Such "luxury", while arguably marking civilized societies, too easily degenerates into extravagance. One possible approach to "sustainable consumption" is to support and strengthen the "ecological middle consumers" (Durning, 1992). Globally, the increasing number of people living in abject poverty, combined with the number among the better-off who lapse into ostentatious consumption, threaten to endanger the future existence of the middle consumers. Equity and social justice may well be keys to a durable and sustainable world. To discuss sustainable consumption, we need to know why people consume beyond their civilized needs. Kates (2000) eloquently explores the intricacies of the issues and gives useful references. Several essays in Crocker and Linden (1998) discuss the motivations behind consumption. Why are commercial ads such a powerful driving force? Is it the attempted fulfillment of daydreams (Campbell in ibid), the emulation of neighbors, or a display of enhanced wealth? If display is the motivating force, then it might help to substitute the assurance of material capability for the actual implementation (Sen, in ibid). For instance, I don't have to stay aloft all the time in order to prove that I can afford all the plane trips I want to take. Such a shift in measuring the standard of living, which Sen calls a "positive freedom," might help to bring sustainability closer to reality. In the end, whether we can attain equitable sustainability depends on the aggregate effects of individual choices (see Part XII.) Institutions can provide incentives and even role models, but every one of us must make his/her own decisions. Certain choices may require us to give up things, or even some of our dreams, for the good of "others" which include those without voices and those yet unborn (Ashby, 1993). A suggestive metaphor is the choice that would face you in an overcrowded lifeboat (the Titanic; the ecosystem). If taking on one more passenger would swamp the boat, do those already aboard have a right to fend off newcomers? Awful though such choices appear, we in fact face them daily. How we live and how we act affect species extinction, environmental quality, and local and national attitudes toward immigrants and refugees. The scale and complexity of real societies may help to buffer our individual impact, yet among all the living species, humans alone are capable of being guardians for global sustainability buttressed by justice. We must act because we alone can choose to make a difference. Ask your students to order their priorities for approaching their own versions of a sustainable society, and to explore and develop their arguments through class discussions. Discuss the reasons people buy things. Ask students to trace the history and rationale on examples of their own decision-making, and the fate of the things bought (a good target might be Christmas presents or an electronic gadget). Explore the issues involved in Lifeboat Ethics, and relate the metaphor to the future of a livable world. In the lifeboat example, a person could conceivably solve the personal moral dilemma by leaving the boat, making room for another; but would that solve the problem? Are there better metaphors to depict the situation facing our crowded Spaceship Earth? (hint: using the Titanic theme, other metaphors might include: better navigation; better preparation against disasters; more and better equipped lifeboats). What moral and value issues do our personal choices entail (see Paddock and Paddock, 1967 and Hardin, 1999)? Ashby, Eric, 1993, Foreword in Environmental dilemmas, ethics, and decisions: R. J.
Berry, editor, London: Chapman and Hall, p. xiv-xxi. Board on Sustainable Development, National Research Council, 1999: Our Common Journey, A Transition Toward Sustainability: Washington, DC, National Academy Press, 363 p.
Crocker, D. A., and Linden, T., editors, 1998, Ethics of consumption: Lanham, MD: Rowman and Littlefield, 585 p.
Daly, H. E., and Cobb, J. B., Jr., 1994, For the common good: 2nd ed., Boston, Beacon Press, 534 p.
Durning, A. T., 1992, How much is enough? : New York, NY, W. W. Norton, 200 p.
Hardin, G., 1999, The ostrich factor: New York, Oxford University Press, 168 p.
Kates, R. W., 2000, Population and consumption: what we know, what we need to know: Environment, v. 42, no. 3, p. 10-19. Paddock, W., and Paddock, P., 1967, Famine 1975! America's decision: who will survive? Boston, MA, Little, Brown, 276 p.
Palmer, A. R., 2000a, Doubling time: it works for ANY rate of change: GSA Today, v. 10, no. 3, p. 9. Palmer, A.R., 2000b Spaceship Earth: there is no place else to go: GSA Today, v. 10, no. 7, p. 7. World Commission on Environment and Development, 1987, Our common future: New York, NY, Oxford University Press, 400 p.
Zen, E-an, 2000b, Sustainability and resources: GSA Today, v. 10, no. 4, p. 8.